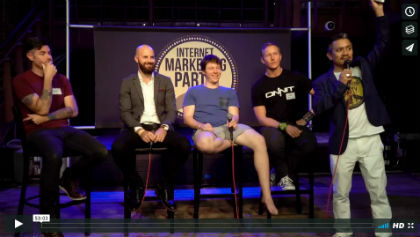 On Thursday, May 18th, 2017 (the night before Paleo f(x)™), four of the most successful online entrepreneurs in the paleo niche got on stage and pulled back the curtain to spill their secrets for getting new customers, creating products that sell like crazy, and quickly growing your online business. David Sinick will reveal the “secret sauce” that’s helped him sell over 150,000 paleo cookbooks in less than two years! Imagine being able to write a book, and selling more than 150,000 copies of it. How would that change your business? Justin Goff will give you the inside scoop on how he sold $31 million dollars worth of supplements and brought in 271,000 new customers in just three years. If you have any interest in selling your own supplements, then there’s no better person to learn from than Justin. Chas Smith will show you how his company, Paleo Valley, has used ecommerce and Amazon to sell over a million dollars worth of beef jerky, paleo protein bars and other paleo snacks. Chad Walding will breakdown how he built an email list of more than 1,000,000 people interested in the paleo diet! Imagine how much money you could make with a list of a million people! Well Chad is going to show you exactly how he’s been able to do that. You’ll learn all of this and much, much more at this special “Paleo Profits” version of the Internet Marketing Party presentation. Imagine the juicy questions the crowd asked to pick-the- brains of 4 entrepreneurs who have been through the ups and downs of building a successful online business. Some of these entrepreneurs charge over $1000 an hour for consulting. You will be able to see what others asked the Paleo Profits panel for just a fraction of that price. Which means you will get specific advice from these experts about real business problems (not just theory). What if you don’t have a paleo-based online business, and you want to learn how to make more sales, more money and help more people… that’s ok… These strategies will help you, too! What if you don’t have a business yet, but you’re interested in starting a paleo-inspired business that allows you to make money doing what you love! This is PERFECT for you. What if you have a successful offline business (i.e. you’re a nutritionist, personal trainer or practitioner) and you want to learn how to get more clients, charge higher fees and work less hours? Perfect! If you fit one of those categories then the Paleo Profits presentation is for you.